What? 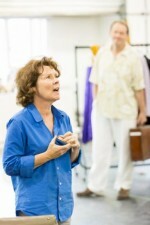 You haven’t seen the new movie “Pride,” starring Imelda Staunton (pictured). Get dressed! Start the car! Race to the nearest movie theatre! After you do, you’ll wish that you were in England, where Imelda is about to open in Chichester as “Gypsy”‘s Mama Rose. She did Mrs. Lovett in “Sweeney Todd” a few years ago, and Stephen Sondheim, who wrote the lyrics for “Gypsy” and lyrics and music for “Sweeney,” privately told people that Imelda was the best Mrs. Lovett ever. (Yes, better than Angela Lansbury.) Publicly, Sondheim encouraged Imelda to take on Mama. She has, and is now doing her through November 8. Is “Sweeney” the New “Dreamgirls”?